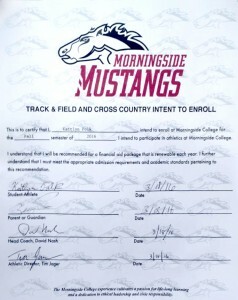 Elgin High School senior Katie Polk made it official on Friday….she’s on the track team at Morningside College. Morningside College, located in Sioux City, IA, is also the college choice of her older brother, Zach, who is pictured in the center of the back row (grey sweatshirt). Zach is a member of the Mustang Mens Basketball Team. Surrounding them are current members of the track team who were on the field practicing on Friday. Head track coach for the Mustangs is David Nash. As a weight-thrower, Polk with work closely with Assistant Coach Stan Simpson. Simpson works with the Mustangs’ hurdlers, weight throwers, and middle distance runners. They offer more than 40 majors, plus 12 pre-professional programs. They belong to the NAIA Great Plains Athletic Conference, and offer more than 20 men’s and women’s Division II teams, but intramural sports as well. With enrollment of nearly 1,300 full-time students, they offer a 13:1 student:faculty ratio, assuring a quality education focused directly on the students. Over the past three years, their graduates have a job and grad school placement rate of 99%. Morningside College is a member of the North Central Association and fully accredited by the Higher Learning Commission (HLC).